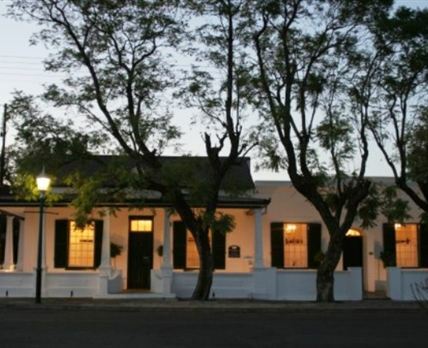 De Kothuize 16 is situated in Graaff-Reinet, the fourth-oldest town in South Africa, with 250 plus declared national monuments. This self-catering Karoo cottage sleeps up to four guests in two air-conditioned bedrooms; the main bedroom has an extra-length king-size bed and the second bedroom has two extra-length single beds. The cottage comprises a shared bathroom with a shower and a bath, a fully equipped kitchen for great entertainment, and a combined sitting and dining room with a television with full DStv. Features include a substantial paved garden area with an outside table and sitting area and secure under-cover parking. The cottage boasts excellent classic antique features including yellowwood floors, as well as beamed and planked ceilings. The property is ideally situated for visiting the town’s extensive museums and other facilities, while several good restaurants are within a short walking distance. Click here to enquire at De Kothuize 16.